A WARNING: Those site visitors of Aboriginal and Torres Straight Islander Culture should be aware that there are photographs and images of the deceased. The author of this blog is a member of the Association of Former Intelligence Officers and as such the views and opinions expressed here are those of the author and do not represent the views and opinions of the Association of Former Intelligence Officers, its staff or Directors. Learn more about the Association including membership requirements at www.afio.com. The Somerton Man Case. The body of a man found on an Australian beach close to a major Atomic Testing ground, he was probably poisoned, a copy of the Rubaiyat of Omar Khayyam and an unbroken Code page found and associated to him. Set against a Cold War background in 1948, was this man a spy? We think so and this blog focuses on the evidence that was left behind and in some cases missed, the Code page, Dry Cleaning numbers, A Poem and a small, torn piece of paper bearing the words TAMAM SHUD. The first image above is from the Major Moulds file which contains some good samples of his handwriting and the second image is of Verse 70 in the copy of the Rubaiyat supposedly written into by Jessica Harkness and given to Alf Boxall. 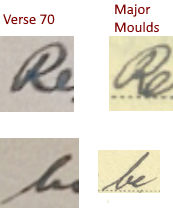 In the previous post, we were able to show the distinct similarities between the signature shown in verse 70 and that of Major William Jestyn Moulds. 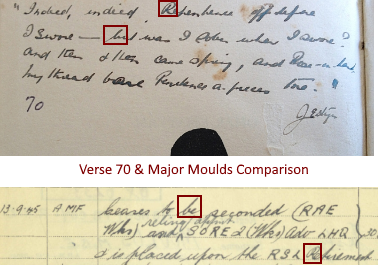 And there you have at least some of the evidence that yet again shows the similarities between the handwriting of Major Moulds and that writing found on Verse 70. I am as sure as I can be that Major Moulds was the person who wrote the inscription in the Rubaiyat given to Alf Boxall. As usual, there's more work to be done on this comparison. We will bear in mind that a handwriting example is rarely an exact match even from the same hand so allowances should be made for slight variances and for the difference in the writing instruments used. The two examples above are extremely close in this instance and they stood out from the first examination. 1. What role did Jessica really play? 2. Why did Alf go to such lengths to conceal the truth? 3. Why did the Police not pursue questioning of Alf? 4. Did the Police know the truth all along? 5. What role was played by Major Moulds? 6. Is this another example of The Association in action? I am sure there will be more questions but right now there's further work to be done on this and on other issues. Thanks for the comment. Short answer is yes, Officers would generally fill in some or all of their own service records, records were kept in the field and also at HQ plus a third set. If you look down the right hand side columnon the service record form you will see a set of initials and amongs them you will see WM. You will also see that there is a duplication of some of the records for Major Moulds and sometimes in a different hand. What you can do is to go through the file, the attestation form is a good starting point, and check samples of his writing and signatures including the signed surname MOULDS and you will be able to match the handwriting from that part of the signature to the letter 'd' for example in the form above and from the other forms he completed and then of course the example provided in the post. Reading up on Army Forms at NAA will also be of some help.You can contact NAA or AWM and ask them the question. Hope this helps! the initials next to the handwriting shown above are definitely not WJM (or any combination of it), although I'll agree some other examples certainly appear to have something that could be WM. I also asked some ex-military colleagues, and a historian from ADFA, and both thought it fairly unusual that someone would write in their own records - apparentl there's a dedicated office for that. But I'd be interested in reading the bit on the NAA that you referred to (I couldn't find it), in case I misunderstood something or my sources are simply wrong. Thanks for the comment, to get clarification on the issue of whether service people filled in their own records, you might find it useful to give the NAA a call. That's where I got the information from in the first instance. They were quite clear on the issue and referred to the various copies, up to 3, one of which was quite possibly signed by the officer concerned. The other question related to one officer filling in the comments and anothersignibg them off as correct. Not quite as straightforward as it may appear it seems. There are other examples of WJMs writing on some of the documents that you might want to look at. Is your point that the handwriting doesn't match or is it more about the process? Can't speak for OP, but for me both are problematic. I think the handwriting isn't all that similar. sure some consideration that different types of pens were used, but to me the differences outweigh the similarity. The R on the right is more flourished, while the b on the left looks more enthusiastic. the e following either letter differs too. All of that said, as the OP points out - unless we're certain the service record is in Moulds' writing, the comparison is irrelevant. Just spoke with NAA, they confirmed yet again that the person who wrote the comments section of the forms is not necessarily the same person who signed off the information as being correct. Indeed the heading for that end column suggests as much. They also confirmed that Officers on occasion did complete their own comments/information on their records. Bear in mind that there could be 2 or more versions of the same form/information which, in the case of Major Moulds seem to have been assembled into one version. With regards to the handwriting comparison, I am sure you would be aware that with handwriting, it is rarely 100% consistent and that individual letters and signatures will vary from day to day or even word to word as is the case with the comparison in the post above. You will note that the letter R for example is shown in the same ink but looks different within the same entry. So for those reasons I disagree with you, in my view the writing is very similar and I am still as sure as I can be that Major Moulds not only signed the verse 70 inscription it is highly likely that he wrote it as well. 8109, many thanks for your message and yes, I do remember that number:) With regards to the issue of handwriting comparison, you correctly state that many regard the process of handwriting comparison as being pseudoscience. There are others that think otherwise and of course that leaves us having to contend with a less than perfect result. What has been found here is that there was indeed someone bore the name JESTYN, a Major William Jestyn Moulds who happened to serve in the same regiment and at the same time as Alf Boxall. The Major used the name JESTYN regularly in his signature and when signing official documents. In actual fact, he is one of only 4 records of men at NAA who bear the name JESTYN either as a first or middle name. Two of them are records of men who apparently served in the CMF, (Civilian Military Forces), a third served in the RAAF. Major Moulds is the only man with the name JESTYN who served in the same regiment as Alf Boxall and to our relatively unskilled eyes, his handwriting, specifically his signature, is noticeably similar to the signature 'JESTYN' found in the copy of the Rubaiyat that was apparently given to Alf Boxall by the nurse, Jessica Harkness. For the record Jessica was never known as 'JESTYN', it was a name given to her by ex Detective Sergeant Gerry Feltus, the author of the book, 'The Unknown Man'. My understanding is that she was nicknamed 'Tina' in her nursing days. We have a link between Lieutenant Alf Boxall, Major William Jestyn Moulds and Jessica. You could say that we have found a 'Major' piece of the Somerton Man puzzle but it leaves us with a question, just Where does that take us? We could start with the RSL and 'The Association'. SOMERTON MAN: First Level of Code Page Cracked! Somerton Man; What Is Wrong With These Images? SOMERTON MAN: Was The Code Page Written With Water? A discussion and summation. Somerton Man, Was his Picture Real or Was it Faked? SOMERTON MAN: THE TORN PIECE, ANSWERS? At the top of this page, you will see an AFIO disclaimer, I am a research member of that organisation. I can recommend it to you if you are at all interested in the history of Intelligence agencies in the West. They publish regular newsletters and great articles as well as 'The Intelligencer' magazine. I joined because I have found it invaluable and it has given me information that would otherwise have been more difficult to source and obtain' Anyone can apply to join and the fee is most reasonable, the application does ask some searching questions as you might expect but nothing onerous. It is a requirement of membership that if you have a blog or deliver presentations or use their information in any way, then you should post a disclaimer. AFIO is a professional and well-respected organisation and I hope that you will consider joining. Exhumation Petition, Please review and sign..